They just don't make em like this anymore. I found this fabulous old black and white photograph on line at the Duke University Digital Collection library and was just enamored. 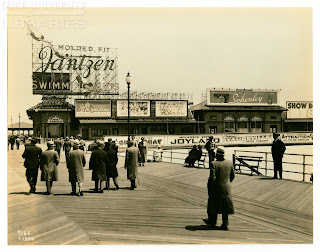 It's May 1934 in Atlantic City NJ, all the gentlemen are dressed pretty warmly. But look at the Jantzen billboard. Please enlarge the picture to view because it is quite distinctive. Note how the billboard is built structurally with the Jantzen typography sign of the 1930s seemingly floating, as are all 3 of the Jantzen red diving girls. Also noteworthy, this is when Jantzen was branding 'swimming suits' rather than bathing suits, and Molded Fit. I've not seen a use of the 3 diving girls in a repeated pattern like this before, pretty darn cool! It looks like the sign was lighted, and I bet the diving girl "moved" when the sign was lit! Love it! It's a Halsman but is it a McCardell?